Bacon is getting to be a plenty popular thing, and everybody is coming up with bacon products that has sprawled out from just the dining table. So far, we've seen bacon soap, bacon coffee, bacon bras, and yes, even bacon lube. 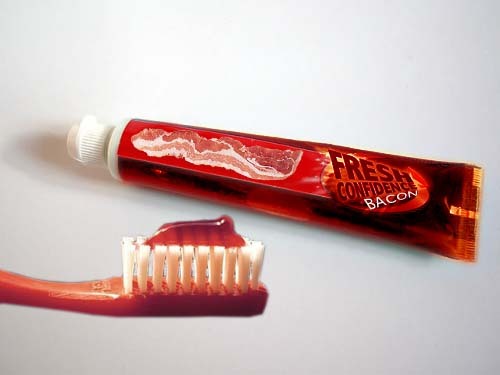 Now we want to join in the fun, and only the coolest would-be thing is missing: Bacon toothpaste! Wouldn't it be cool? Like, to clean those pearly whites with bacon-flavoured toothpaste and have a long-lasting fresh breath of bacon? It may not look very appetizing, but it has that lovely porky taste and smell of everybody's favourite bacon!